This study examines how residents from a high-crime, high-poverty neighborhood in East Baltimore interact with one another, participate in their community, and perceive police. Using community surveys collected from 191 respondents, the study empirically measures collective efficacy, community participation, and police services and encounters. We predict that high levels of collective efficacy lead to more positive perceptions of police and an increased willingness to work with law enforcement. The results indicate that neighborhood trust is an important factor in shaping a community’s overall perception of police. Furthermore, older residents who own their homes are more likely to report a more positive perception of police, specifically police response. Iyer, S., C. Knott, and A. Cantora. 2013. McElderry park: Community plan for crime reduction. Baltimore Neighborhood Indicators Alliance, Jacob France Institute, University of Baltimore. http://www.bniajfi.org/wp-content/uploads/2015/03/McElderry-Park-BCJI-Plan-Year-1-Final.pdf. Accessed Nov 2018. Iyer, S., C. Knott, and A. Cantora. 2015. McElderry park: Byrne criminal justice innovation grant. Final report for year 2 funding (2014–2015). Baltimore Neighborhood Indicators Alliance, Jacob France Institute, University of Baltimore. http://www.bniajfi.org/wp-content/uploads/2016/05/BCJI%20Year%202%20Report%20FINAL.pdf. Accessed Nov 2018. Iyer, S., C. Knott, and A. Cantora. 2016. McElderry park: Byrne criminal justice innovation grant. Final report for year 3 funding (2015–2016). Baltimore Neighborhood Indicators Alliance, Jacob France Institute, University of Baltimore. http://bniajfi.org/wp-content/uploads/2017/05/BCJI-Year-3-Report.pdf. Accessed Nov 2018. Schaefer Center for Public Policy. 2012. Baltimore city citizen survey. University of Baltimore. Retrieved from https://finance.baltimorecity.gov/sites/default/files/citizensurvey.pdf. Accessed Nov 2018. Uchida, C.D., M.L. Swatt, S.E. Solomon, and S. Sean Varano. 2014. 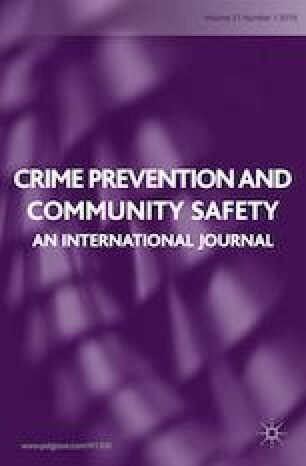 Neighborhoods and crime: Collective efficacy and social cohesion in Miami-Dade County. U.S. Department of Justice. Retrieved from: https://www.ncjrs.gov/pdffiles1/nij/grants/245406.pdf. Accessed Nov 2018.